Steven Matz was supposed to start Thursday. 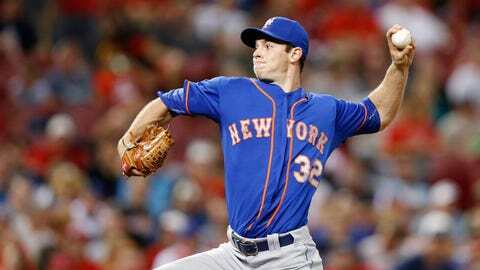 PHILADELPHIA — New York Mets rookie left-hander Steven Matz has been scratched from his scheduled start on Thursday against the Philadelphia Phillies because of a back injury, putting his playoff availability in question. Matz had been slated to pitch in Wednesday’s game, then was pushed back a day when he woke up Tuesday with a sore back following a poor night’s sleep. Manager Terry Collins said Wednesday the back issue was lingering. Matz is 4-0 with a 2.27 ERA and 34 strikeouts in six starts. He didn’t pitch for the Mets between July 5 and Sept. 6 because a partial muscle tear in his left side. The current injury is on the opposite side of his back. The NL East champion Mets open the playoffs on Oct. 9 against the Los Angeles Dodgers, and Matz was in line to be their No. 4 starter. "We have to make a determination if he’s going to fit or not," Collins said. Collins said he could use Matz in a relief role this weekend to determine the pitcher’s fitness.